Continuous in-line (also referred to as on-line) moisture monitoring systems are being used by manufacturers of all types of goods to verify that the product being packaged is at the optimal moisture level to ensure the best quality of the finished products for their consumers. Additional reasons for using these types of sensors include automating the drying or moistening processes of materials for consistent product quality & energy cost savings and receiving real-time moisture data without having to make numerous laboratory samples. Ability to easily incorporate the sensor into their process and receive continuous, real-time measurements instead of having to take multiple laboratory samples. Capability to measure the moisture to the product's core instead of just the surface to increase the consistency of the measurements. 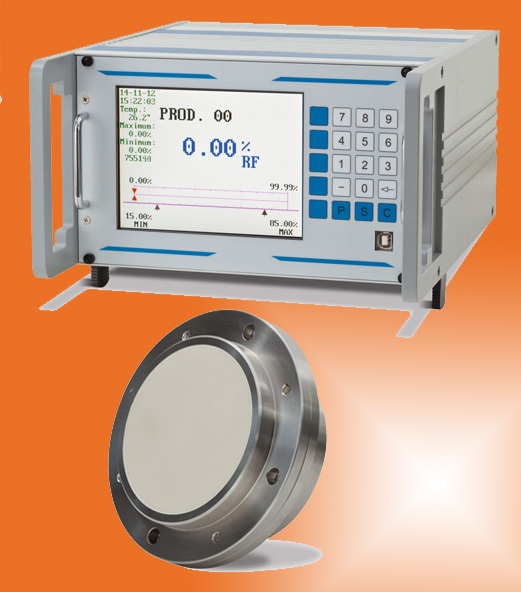 Ability to receive fast and precise measurements with accuracy. Durability of the sensor and the sensing surface to withstand a particular product's characteristics (ex. abrasive). Capability to have the sensor output communicate with an existing control system to receive alarms and control the processes or the option of a local operator interface / controller. Cement, Sand, Aggregates, Coal, Feed and Grain, Cereal, Malt, Flour, Sugar, Spices, Potato products, Dried Food / Products, Wood Shavings, Chemicals / Fertilizers, Powder, Pigments, Plastic granules and more. A silica sand company located in the southern US was looking for a method to validate the proper moisture content of their sand prior to it being size classified and packaged for their consumers. It was particularly critical that the moisture measurement be performed in-line (on-line) within the process, thereby achieving real-time results without the delay associated with sampling systems. Prevent sand that is too moist from getting to the particle size screen and blocking it up. A blocked condition can slow down or even stop valuable processing time and possibly cause equipment damage. Ensure sand being packaged was at the proper moisture content to achieve the best quality of the finished products for their customers. Their process consists of taking the raw sand from a receiving hopper and conveying the material to the dryer. After the drying is complete, the sand is belt conveyed to a bucket elevator system that brings the sand to the particle size screen. The sand is then sorted by size and sent to bins that dispense the sand for packaging. The company did some research and decided to use the HumiCoreTM PRO in-line (on-line) moisture measurement system. Before the sensor was installed, the company and sensor manufacturer collaborated to determine the optimal location to place the sensor. The moisture sensor was installed immediately following the dryer using a sled to glide across the surface of the sand. At this point, the sand is being conveyed to the size-sorting screen. If the sensor detects a higher level of moisture in the material than desired, an alarm is sent to the control room. Then a chute can divert the sand back to the dryer before it is re-sent through to the sorting screen. Using an optional DIN-Rail transmitter, the company was able to have the output signal of the moisture sensor integrate easily with their other control functions. The HumiCore system has been successfully working as anticipated and the company is very pleased with the results. Continuous in-line moisture measurement sensors used for process monitoring of product moisture in solids and emulsions applications are usually based off of a few common technologies. These technologies include near infrared (NIR), high frequency field and microwave. The HumiCore™ Pro moisture sensor, chosen by the example company, uses a circuitry principle that is centered around an electrical high frequency field. This is based on technology that has been developed and proven to be successful over several years. Ability to measure moisture within the material core. In many applications, it is critical to measure not just the surface moisture, but rather the inherent (average) moisture through the core of the material. Drying processes extract moisture from material by exposing the material’s external surfaces with heat. Naturally the surfaces closest to the heat source will see a greater moisture reduction. The high frequency field technology is able to penetrate the material nearly 8” (200mm) so the attained moisture measurement is actually measuring the material core, a truer representation of the actual moisture content. This is a critical difference to near infrared (NIR) technology which is only able to measure the surface moisture of the material. Ability to measure moisture regardless of particle size, particle shape, particle surface characteristic or color. The high frequency field technology is not affected by these material characteristics. - Compact design for easy calibration and installation in conveyor belts, screw conveyors, drag conveyors, etc. The DustTrendTM ES, Monitor Technologies' latest dust monitoring / leaking filter detection system, has an easy auto set-up function that is activated by pressing a button to automatically configure parameters / alarms. The DustTrend ES dust emission trend monitor adds the ability to provide continuous trend measurements that allow plant operators to identify changes in dust emission levels and optimize the facility's filtration systems. It also provides 4-20mA analog output and/or Modbus(RS-485) output. The monitor delivers excellent repeatability that is not affected by variations in relative humidity, process temperature or pressure. It uses proven AC Triboelectric technology with advanced algorithms to filter out noise and provide the most accurate dust measurement. Ideal for monitoring the level of dust emission in dust collection systems (exhaust ducts of bag-houses, cartridge collectors, cyclones, etc). Anywhere it is critical to safety, maintenance, equipment operation, plant efficiency (energy-savings), employee welfare and the environment. Also available is the DustAlarm® ES with easy auto set-up, which is an economical broken bag detector / filter leak monitor that provides an alternative to opacity detection. Both monitors can be connected with the free DustConfigTM software to set custom alarm points, view live activity within the duct, or review data history for up to a 24-hour period. Additional features for both units include two conduit openings, bi-color LED indication, die-cast aluminum housing and USB mini-B port for communication with DustConfig software. For more information please visit www.monitortech.com, e-mail monitor@monitortech.com or contact us at 1-630-365-9403. How Many Figs does it take to Equal 150 Newtons? Vibratory point level sensors or probes are great products for powder and bulk solids applications where the material being sensed has a very low dielectric constant that might be lower than an RF Capacitance probe could detect. They are also good alternatives for rotary paddle bin indicators in application with extremely low bulk density values. Expanded poly-styrene beads have a bulk density that is typically less than 2 lbs/ft3 (.032g/cm3). Paddle type sensors and especially high level paddle type sensors would very likely cavitate when covered with material this light and give no indication that material is indeed present. What if we have an application for a bin whose material frequently changes and we were using a rotary paddle bin indicator? If the bulk density decreases, at some point the paddle being used will start to cavitate and a paddle with a higher surface area (increasing the effective sensitivity) would need to be installed to allow the paddle type sensor to regain functionality. There will be a lower limit of bulk density vs. area of the paddle that once reached will ultimately render the paddle type sensor useless for the application in question. If an RF Capacitance probe is being used in silos, hoppers or bins and the material is changed to something with a radically different dielectric constant, probe re-calibration might be required. This is where a vibratory probe is a great choice because there is no calibration per se. Many vibratory probes on the market do have a general sensitivity setting that can be changed but that is an adjustment the rarely needs to be set differently than the factory default. The main downside of a vibratory probe is that it is generally more expensive than a rotary paddle or RF Capacitance type of sensor. Another negative feature of a vibratory probe, and main point of this article, is that models that are high in sensitivity and able to detect materials with very low bulk densities are typically not as physically strong in comparison to other point level technologies. So when we use a vibratory probe, we must strictly adhere to the manufacturer's installation guidelines. 150 Newtons = 33.7 pound-force. 500 Newtons = 112.4 pound-force. 1000 Newtons = 224.8 pound-force. One of the most common reasons for vibratory probe failure is from the probe having been subjected to forces beyond their design limitations. Such a condition can actually bend the probe rendering it useless. Other modes of failure include broken components within the probe housing or within the probe element if it is a rod type or diamond shaped design. Below are examples of parameters for vibratory probes. OK, here come the Newtons. Monitor's DuraVibeTM Model PZP probe has two separate force limitations. The probe must be installed such that the narrow edge (knife edge if you will) of the probe is always pointing up. The PZP can withstand 1000 Newtons max in this plane but will only withstand a maximum force of 150 Newtons along and perpendicular to the axis on the wide side of the probe. Our DuraVibeTM Model VibraRodTM probe is constructed using a hollow tube that is cylindrical shape and is rated at 450 Newtons max in any plane along and perpendicular to the axis. Generally speaking, either probe should be shielded from direct impact from material falling directly on the probe during the filling process depending upon material characteristics. There are suggestions for doing so in our Installation & Operation Bulletins for these products. So, when you need or want to use a vibratory probe, be mindful of all forces the probe will be exposed to during fill and also when material is being drawn out. How and where the probe is mounted to the vessel will have a direct influence on the amount of force the probe is subjected to when the material contained in the vessel is in a dynamic state. Mass flow silos and hoppers will produce more force against the probe than its funnel flow counterpart would exhibit. Properly placed baffles will correct this problem. Also determine if there will be any significant side or lateral horizontal loads that either require silo modification or require the selection of a different style of probe so ensure that maximum force specifications are never exceeded. If you find yourself needing or desiring a vibratory probe and you have determined a need to install protective baffles or shields but you are unable to install them, you should consider using a top mounted cable extension model or a rigid pipe extension model. A cable extended probe will allow the actual sensing portion of the probe to hang freely at the desired point of material detection without exceeding specified lateral force limitations. See examples below. Now if this seemed all too gloomy for you, relax. We have many successful applications in materials with bulk densities as high as 100 lbs/ft3. You just need to think about the application and install the probe in such a manner that its limitations are not exceeded. When in doubt, give our Technical Support department a call at 800-766-6486 or 630-365-9403 for advice and guidance. We are here to assist you by providing practical solutions on and at every level we can. © 2010, 2017. All rights reserved. Bulk materials, especially powders, stored in vessels can settle (pack) and tend not to flow well through a process system. Monitor Technologies’ offers some bin aeration devices that are simple solutions to maintain the flow of dry bulk powders and granular solids in storage vessels. Monitor’s booted Evasser aerator is compact, durable and capable of aerating / fluidizing many types of bulk powders and granular solids in bins, hoppers and silos. It operates by constantly presenting air to the mass of the stored material. The Evasser features no moving parts, no filters to change, and no loud noise or damaging vibrations. The Evasser bin aerator is also available with a convenient external mounting plate. Monitor’s Rectangular Air Pad operates by continuously introducing air into the body of the dry powder to maintain fluid-like characteristics. Highlights of the Air Pad include rugged construction, low cost, minimal maintenance, easy to install and adapts to almost any bin configuration. For more information visit www.monitortech.com or contact Monitor's Technical/Application Support Team at Tel. : 1-630-365-9403.